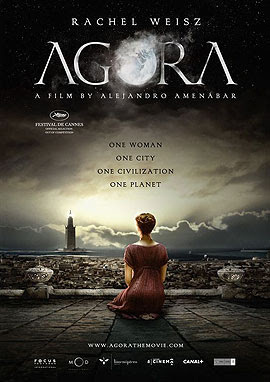 HONEY AND HEMLOCK: Historical Inaccuracies of the Movie "AGORA"
The movie Agora is a study on the life of the Alexandrine philosopher Hypatia, during the turbulent era from the end of the 4th to the beginning of the 5th century A.D., in Alexandria of Egypt. To begin with, it should be noted that the director of the film, Alejandro Amenabar, is an atheist. By his own admission, he was born and raised in a Christian family, then became an agnostic and later on an atheist. This information is being highlighted, so that it will be comprehended why the movie - albeit seemingly not turning against the Christian religion - is in fact portraying the Christians as fundamentalist, obscurantist, ignorant and fanatic, and ending up with an innuendo that a very important Christian saint, the Patriarch of Alexandria Cyril, was nothing more than a fanatic clergyman and the moral instigator of the assassination of Hypatia. The main historical source for the refuting of this movie's inaccuracies is the work by the historian Socrates the Scholastic, Ecclesiastic History. He had lived in the same era as Cyril of Alexandria. His writings are especially weighty, given that Socrates belonged to the heresy of Novatianism. This heresy was one that Cyril had fought against passionately. At the beginning of the movie, idolaters appear to be verbally provoking the Christians, and thereafter being attacked by them. According to Socrates the Scholastic, Patriarch Theophilos of Alexandria and Cyril's uncle, had taken strict measures against them and had destroyed the Serapeum and the Mithraeum. The reason for this, was that the idolaters were attacking Christians, which is why the former were afraid of the Emperor Theodosius II's wrath. However, in the movie, Hypatia's father and an important mathematician, Theon, is presented as being wounded during the destruction of the Serapeum sanctuary and eventually dying on account of that wound; in reality, the cause of Theon's death is unknown. His death is thought to have taken place around 405 A.D. According to the movie, the underlying cause for so many idolaters seeking to enter the bosom of Christianity was the harsh stance of Patriarch Theophilos; the truth is, however, that a statue that was inside the Serapeum sanctuary bore the symbol of the Cross on its base, and that this was the cause for so many idolaters to believe and be baptized as Christians. Equally false is also the indication that after the death of Theophilos, Cyril appoints himself as his uncle's successor, by donning the deceased's hierarchic vestments and his ring. In the realm of Orthodoxy, Patriarchs do not wear rings as a sign of their hieratic authority. There is no historical mention anywhere that Cyril wore a ring that would make his authority apparent. He succeeded his uncle Theophilos, following a contest with Archdeacon Timothy for the patriarchal throne. Cyril maintained a harsh stance towards the Gentiles, because he regarded them as being responsible for the tendency of several Christians to be involved in sorcery, astrology and not astronomy, and in general for remaining attached to superstitions, biases and paganism. He himself had studied the classical authors of ancient Greece, but also the major philosophers such as Plato, Plotinus, etc., which is especially evident in his work "Against Julian". In the movie, Ammonius is portrayed as a fanatic "Bath Fraternity" individual (παραβαλανεύς), who, for the sake of impressing the idolaters walked barefoot through fire. However the Christians of that era - and in general - never indulged in miracles for the sake of impressing others, nor to convince those who were negatively disposed towards them. The truth is that Ammonius was a monk from Nitria. In the region of Nitria there were about five hundred monks, who fervently upheld the Christian teaching. Cyril had lived monastically with them for quite a number of years. Perhaps it is to them that the Alexandrian Patriarch's passion to defend the Christian teaching can be attributed. On account of Ammonius' verbal attack on the Eparch Orestes and the stone that he threw at him, he was arrested, tortured, and put to death. Cyril called him a martyr and buried him with honors, but in the movie, Cyril is presented as proclaiming him a saint. In Orthodoxy, saints are proclaimed by God as saints, and not by people. In the movie, the Eparch Orestes is presented as a Christian striving to maintain delicate balances between the Judean, Gentile and Christian inhabitants of Alexandria. Orestes had most probably acceded to Christianity out of political interest, which is made evident in the movie also, when a question was posed by Synesius, the Bishop of Cyrene. The latter asked Orestes if he truly believed in the God of the Christians, or if he became a Christian out of interest. Socrates the Scholastic mentions that by many Christians of Alexandria, Orestes was referred to as "Sacrificer and Hellene", implying that he was an idolater on account of his unjust behavior towards Christians. The same historian further mentions the hatred that Orestes felt towards Christian bishops. There is also no mention anywhere in the movie of the tortures that Orestes had imposed on Hierax, a confidant of Cyril. As for the episode with the Judeans at the theatre, according to historical sources the Christians had not stoned the Judeans in the theatre on the Sabbath. On the contrary, they were accused publicly that instead of listening (as their religion demands) to the word of God in their Synagogues, they were at the theatre. The Hebrews point out to the Christians that Christ was also a Hebrew and that without them, the latter would not have existed. This argument cannot hold water, simply because the Judeans had not acknowledged Christ as the Messiah and the Son of God, but only as a false prophet. Ηypatia is portrayed in the movie as a young and beautiful woman, and a friend of Orestes. We have no indications from historical sources if she was a beautiful woman; but she was certainly an extremely well educated one. She could not have been at a young age, given that if she was born in 365 A.D., at the time that Cyril became Patriarch, she would have been nearing the age of fifty. This was quite an advanced age, both for men and women during that time; subsequently, the myth of a young and appealing woman, which had acquired flesh and blood thanks to certain pseudo-historians of Mediaeval times, is debunked. Furthermore, it was a well known fact to all the inhabitants of Alexandria during that time that she was the main reason that Orestes could not achieve excellent relations with Cyril. Nowhere is it mentioned historically that Cyril regarded women as being inferior, the way it is presented in the movie. In the specific scene, as Cyril was reciting Paul's second Epistle to Timothy, he is shown as preaching that the woman is inferior to a man. Cyril could never preach anything like this, because in his works, he had stressed that a woman's place was elevated, in the person of the Theotokos, the Mother of Christ, the new Eve. Besides, this would have gone contrary to the teaching of Christ Himself, Who had elevated woman and made her equal in honor with the man. The same is also stressed by Paul, in his Epistle to Ephesians, and chiefly in the excerpt that is recited during the Marriage Sacrament. According to Socrates' reference, Cyril had judged Orestes for his various incongruities, based on the Holy Bible. To refute Cyril's accusations as well as the other Christians', the Eparch stressed that he himself was also a Christian, who had been baptized by Atticus of Constantinople. There is no mention whatsoever in historical sources of that time that Cyril had ever referred to Hypatia as a sorceress; on the contrary, he appeared to have had a great respect for her scientific knowledge. Historically the Patriarch of Alexandria was not an obscurantist. In fact, he had studied the works of Basil the Great, Gregory of Nyssa, Origen, etc. He had read or had been taught ancient philosophy and had espoused the scientific theories of their era. It is natural, that all of them would be examining the various scientific views through the prism of Christian teaching. It is worth noting that many Christians were also students of Hypatia - for example Synesios, Bishop of Cyrene, his brother Euoptius of Ptolemais, perhaps Isidore of Pelusium, and others. The movie presents the Christians - chiefly the "Bath Fraternity" members (παραβαλανείς) - not only as obscurantists, but also ignorant. In one of their conversations among themselves they are shown as saying that the earth and the sky resemble a chest and also as rejecting theories pertaining to astronomy. Naturally Christians did not reject the theories of astronomy, nor was punishment on the pyre prevalent for those who espoused them. Besides, major ecclesiastical fathers such as Basil the Great had studied astronomy, mathematics, etc, which they make reference to in their works. Finally the movie regards Cyril as being the moral perpetrator of Hypatia's death; however, neither Socrates the Scholastic nor any other historical source of that era ascribes such an act to the Patriarch of Alexandria. If there had been even the slightest suspicion that Cyril had indeed participated in the assassination of the philosopher, it would have been exploited by Nestorius of Constantinople in the theological dispute that he had with Cyril. Furthermore, his assorted enemies would have also made references to it. The Patriarch of Alexandria was proclaimed a saint by the Triune God, not only for his life but also for his theology on the incarnation of the second Person of the Holy Trinity, as well as for his defense of the term "Theotokos" for the mother of our Lord Jesus Christ. In conclusion, the movie may have beautiful scenery, however the subject that it is dealing with - Hypatia and her death - and the way it is being dealt with, has given rise to neopagans and the adversaries of Orthodoxy to believe that they have found footholds against Christianity. But unfortunately for them, their arguments are spurious once again. Socrates, Ecclesiastic History 7,7 PG 67, 752A.
. Cyril of Alexandria, Against Julian: In favour of the benevolent religion of the Christians, to Julian of the atheists, Ι - ΧΙΧ, P. Evieux, SC 322 (t. I-II), Paris 1985, pg. 100-318 (PG 76, 504A-1064B).
. The παραβαλανείς (Bath Fraternity members), who comprised a special organization and were involved in works of philanthropy - something that is made evident in the movie - remained close to the church baths, from whence they got their name. And according to Socrates, they were given over to social uprisings. Quite often however, they acted unbeknownst to the Patriarch at the time, and for that reason, they were placed under the jurisdiction of the Eparch, by a law that was issued by the Emperor Theodosius II on September 28, 416.
. Socrates, Ecclesiastic History 7,7 PG 67, 764A.
. Ibid, 7, 13-34. PG 67, 761C-764C.
. Ibid, 7, 13.1. PG 67, 761CD.
. Ibid, 7, 15. PG 67, 768Β. cmp. Nicephoros Kallistus, Ecclesiastic History 14,16, PG 146, 1105C-1108B.